Aw, the merry, merry month of May...2016. Buyers were suffering from either FOMO or a collective brain fart or maybe both. I wrote back on Oct 31st (Stats Post #4) in addition to peak sales it was the month of peak stupidity. I can’t help but wonder if the buying frenzy would have taken its turn one month earlier if the public hadn’t been exposed to the good fortune of retired Vancouver lawyer Jonathan Baker who sold his home in Vancouver Dec 2015 and moved to the Sunshine Coast while “pocketing millions” in the process. (Stats Post #2). You can see sales slowing in April and then take off again in May. 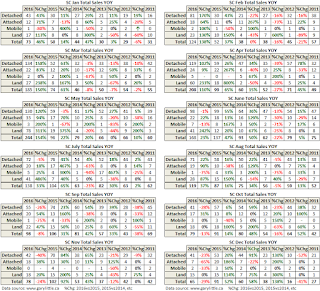 Here’s the chart again with its accompanying table giving all the numbers. Total sales in 2016 topped 2015 by 47.4% and 2014 by an eye-popping 108.6%. 2015 sales rose 41.5% versus the year before.You’ve already seen that land sales (Stats Post #5) set a new record high in 2016 and million dollar plus detached properties likely did too (Stats Post #6). Here’s how 2016 sales panned out over the year. The chart above shows sales fell almost as quickly as they had rose. By the end of May, inventory as exhausted. Detached and attached listings were more than half what they were one year earlier. Collectively, April 2016 offered 47.7% fewer listings than April 2015. We know what happens when demand is high and supply is low...prices rise. 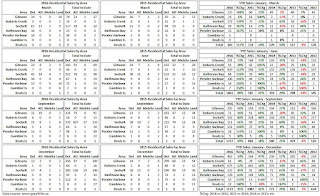 For those who love stats, here are the month-to-month tallies with their year-over-year counterparts going back to 2011. As mentioned above, attached inventory had dropped more than 50% by April 1 2016 year-over-year. 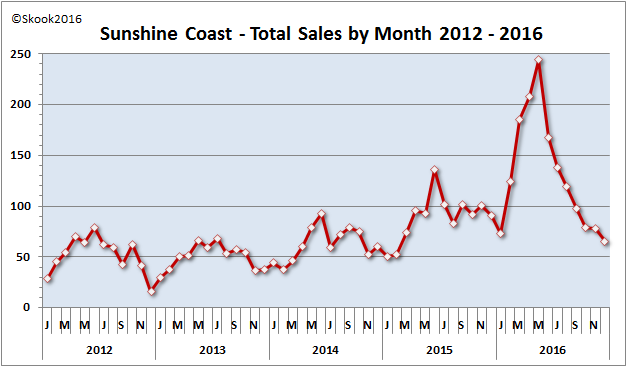 Here’s the REBGV tally for 2016 attached sales with YOY comparisons back to 2011. I may not have posted the 2016 stats last year but I collected the data and kept producing the tables. However, to now make images of all those tables and expect there might actually be people willing to wade through them seems a bit much. 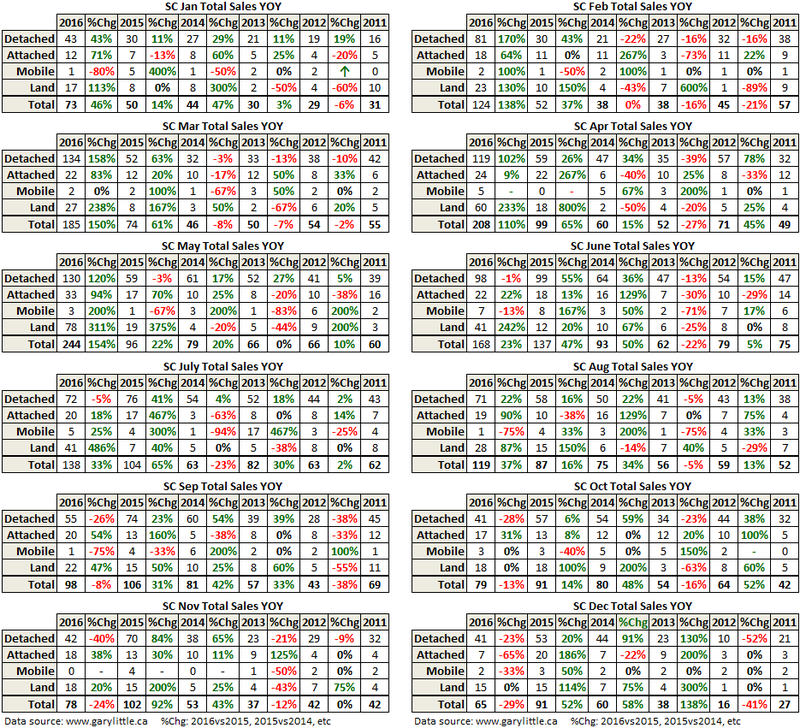 So, I’ve decided to make images showing quarterly results only which will at least show any developing sales trends. The image below shows the ‘residential sales by area’ quarterly results. 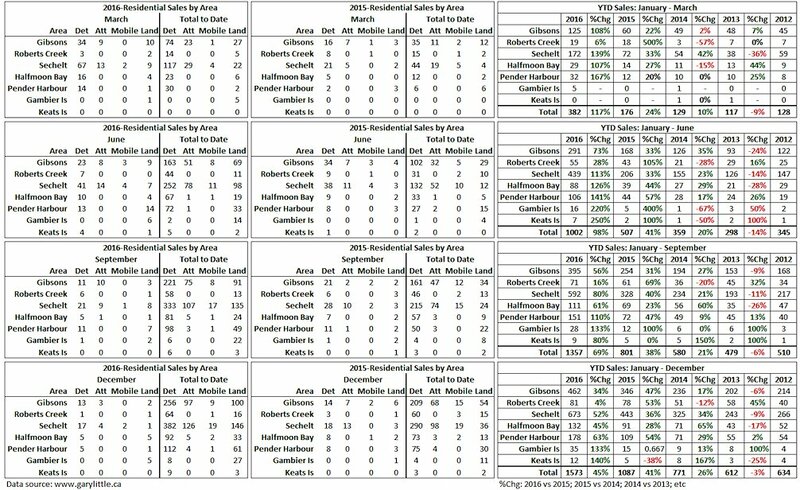 The first quarter shows total sales year-to-date (YTD) increased 117% year-over-year (YOY) with the Halfmoon Bay market up 107%, Gibsons 108%, Sechelt 139%, and Pender Harbour 167%. We would expect as much given the total sales chart at the top of this post. While the percentage changes decreases in the remaining three quarters, sales were still up substantially YOY. By year end, 2016 total sales increased 45% compared to 2015. The slowest market area was Roberts Creek with a 4% sales increase. Gibsons was next at 34% YOY followed by Halfmoon Bay 45%, Sechelt 52%, and Pender Harbour 63%. Island sales closed the year with the largest YOY percentage increases with Gambier 133% and Keats 140%. 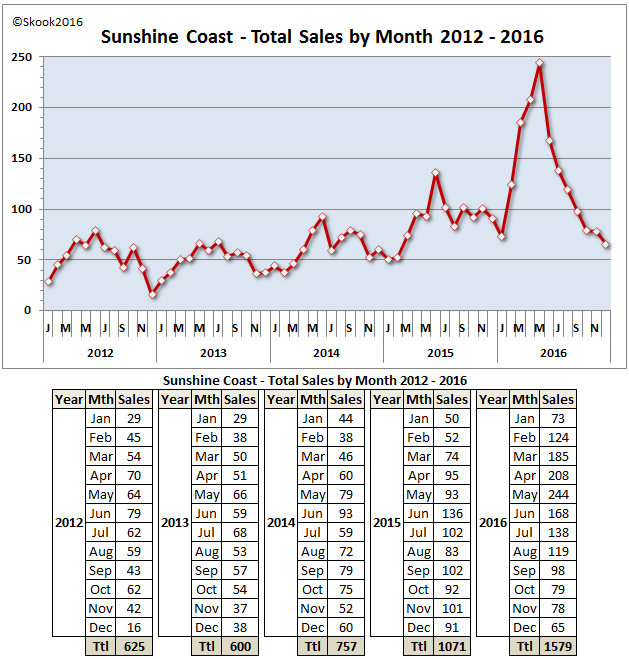 The next 2016 SC stats posts will concentrate on single detached home sales.